The latest claymation feature from Aardman, and the first directed by Nick Park since helming the animation studio’s Oscar-winning Wallace & Gromit: The Curse of the Were-Rabbit in 2005, Early Man is a delightful caveman comedy that boasts their trademark mix of clever visual humour and witty one-liners. Dug (Eddie Redmayne) is one of the members of an unadvanced Stone Age tribe, who are presided over by Chief Bobnar (Timothy Spall), and struggle to even complete their simple tasks of hunting rabbits. They are simple cavemen, after all. But when their valley is invaded by the pompous Lord Nooth (Tom Hiddleston), who hails from the Bronze Age and wants to mine it for resources, they end up having to compete in a football match in order to get their land back. Along the way, Dug also meets Goona (Maisie Williams), a young woman who becomes an invaluable companion as his tribe trains to defeat the more sophisticated Bronze Agers on the football field. What follows is essentially an underdog sports movie, playing out in Aardman’s signature claymation style. While this might not be Aardman’s most sophisticated work – the plot is fairly simplistic, and it’s pretty predictable how things are going to turn out – the film more than makes up for this with a fast pace and a great sense of humour. 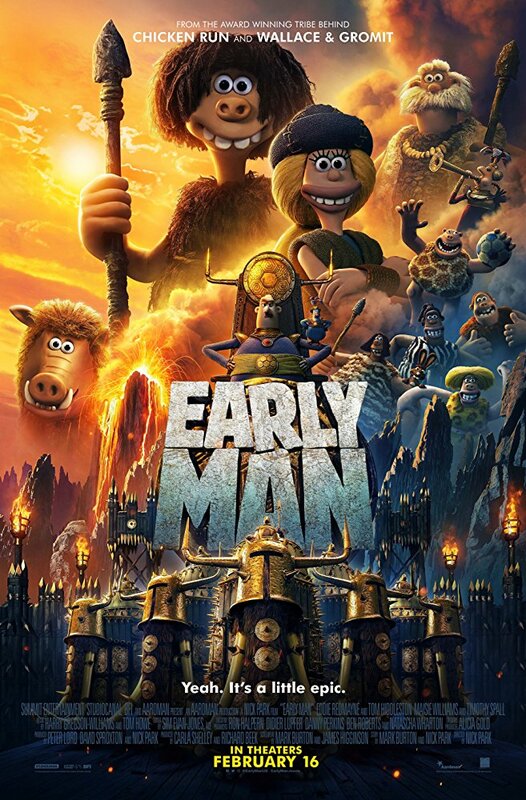 The look of Early Man will be immediately familiar to all fans of Aardman’s playful stop-motion animation and stylized character designs, from the wide mouths and exaggerated noses on the humans, to the buck-toothed bunnies that look like they hopped right out of Curse of the Were-Rabbit. Even Dug’s animal companion Hognob, a pig whose grunts are provided by Nick Park himself, recalls Gromit in both his look and behaviour. The whole cast seems to be having a lot of fun with their roles, right down to Rob Brydon’s animated equivalent of a scene-stealing performance as the Message Bird, a delightful avian character who flies about delivering messages and mimicking an answering machine. The film is chock full of Aardman’s unique brand of inventive sight gags and punny lines, and it’s an amusing delight to watch. I had a smile on my face throughout, and found myself chuckling constantly. It’s simply a lot of fun.